The problem with American Sniper is not necessarily that it’s controversial — though that train of thought is somewhat justified — but that it’s rather dull. In regurgitating a story set almost entirely during the worst of the conflict in Iraq post-9/11, and one based upon real events, you’d expect director Clint Eastwood to have something potent to say about war. At the very least, it’d be fair to expect a consistently taut human drama. We get neither from American Sniper, a film weighed down by overt patriotism and silly writing. 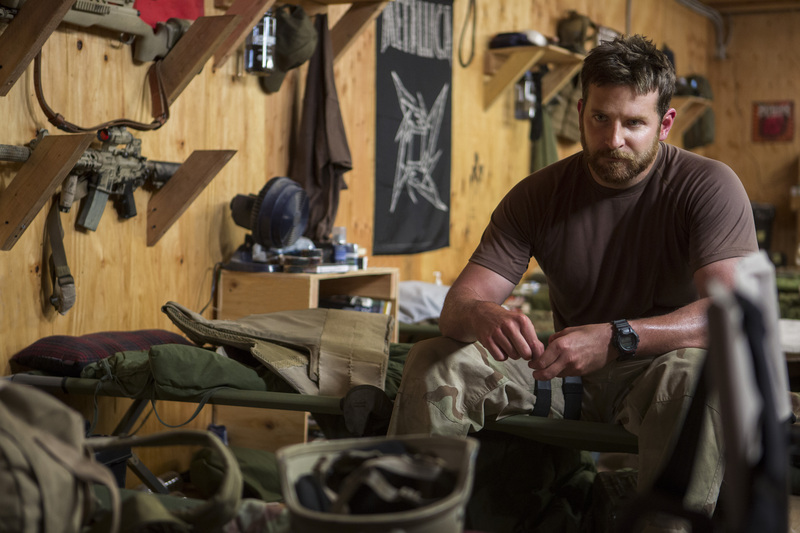 Bradley Cooper (now the recipient of three consecutive acting nominations at Academy Awards) stars as US Navy Seal Chris Kyle, a former rodeo cowboy so pained by news reports of terrorist attacks on his home soil that he enlists to fight abroad. It’s nothing more than a solid performance from Cooper, certainly not one on the same level as his two previous Oscar nominated stints in both Silver Linings Playbook and American Hustle. As the film progresses the bulked up actor’s role becomes an increasingly emotionless one, and consequentially quite thankless. Buying into the personal struggles of a man who spends his time in a place littered with death and despair — he, frankly, contributing to the mess — is a struggle in and of itself. This isn’t a critique of the real Chris Kyle, nor Cooper, and instead of the poorly conceived writing underpinning proceedings. Adapted from Kyle’s own autobiography, Jason Hall delivers a screenplay severely lacking in nous or subtlety. Bearing no stance on the Iraq War that hasn’t already been exhausted on the big screen, or any screen, what we’re left with instead is a film trying desperately to convince itself that war is necessary. Men, women and children are all cast under the same umbrella marked “our enemy” and though this non-discriminatory outlook may well be a sporadically accurate reflection of reality, the film never suggests such a thing. Many of those whom the US soldiers meet in Iraq are carrying weapons with a view to kill. The suggestion is all civilians have been evacuated from the area of conflict, thus the ones who remain aren’t innocent. The fact that this wholesale evacuation hasn’t taken place compounds a lazily devised screenplay; as such, locals are placed on a morality gauge ranging from untrustworthy to terrorist. In between head-scratching scenes that show Kyle conversing with his wife in the middle of a war zone — his attention should probably be on shooting all those baddies, right? — there’s a cat and mouse game playing out. An enemy shooter referred to as Mustafa (Sammy Sheik) is essentially the domestic Chris Kyle. Granted, the film is called American Sniper and therefore isn’t a piece that was ever going to pay as much attention to the non-American sniper, but the lack of dispersed humanisation is off putting. Kyle’s rapidly burgeoning Call of Duty kill count is celebrated with gusto amongst his peers whereas any damage done by Mustafa is vehemently denounced as the work of a “savage”. Of course it’s savagery, but there’s hardly even a nod towards the ambiguity of Kyle’s actions — when the film does venture down this route it only juggles the immorality of child-killing as opposed to people-killing. The picture is at its most tense and best when Kyle is staring down the barrel of his deadly weapon, honing in on said infants and fuelled by uncertainty. Unfortunately any good work is undone by a laughably glorifying final sniper showdown. Intrigue edges up a tad when we’re back on home soil, where the military man feels more and more out of place as each tour ends. Sienna Miller plays his wife but doesn’t get enough to do as the narrative always chooses to follow Kyle when he goes overseas. She’s good though, infusing a bit of steel into Taya whilst also relaying the mental and physical exhaustion brought on by her husband’s constant displacement. Miller just about manages to overcome her unnecessarily bit-part function. 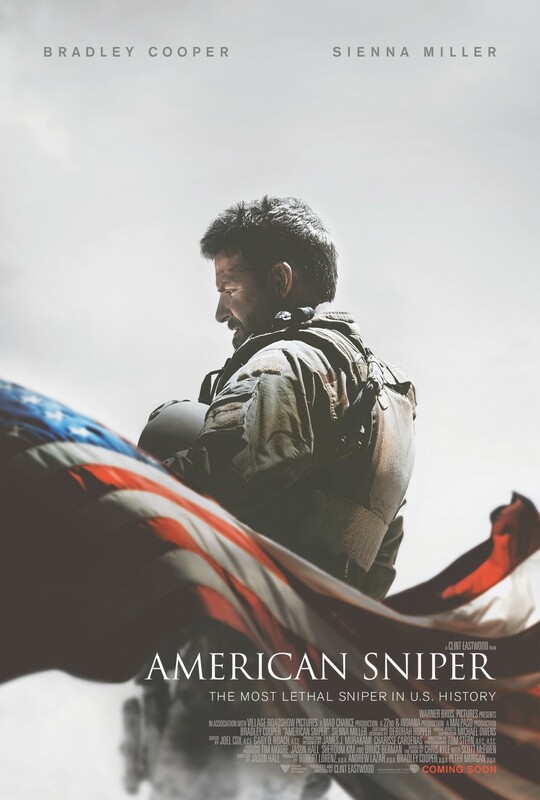 It’s this lack of urgency that hampers American Sniper, more so than any controversial portrayal or underwhelming performance. You’d expect it to be well made, and it is, but it doesn’t have the musky atmosphere of a Hurt Locker or the gruelling presentation of a Fury, nor does it bear the rich characterisation of those films. Tom Stern’s projection of a war zone is almost conventional, which is surprising given the cinematographer’s accomplished portfolio (Mystic River, Million Dollar Baby, The Hunger Games). Eastwood doesn’t do an awful lot to alleviate this encroaching mundanity, he generating a tone that stops short at implying the possibility of danger lurking around every pile of rubble. American Sniper has done extremely well at the US box office and, despite a more conservative reception over here in the UK, has undeniably been a success — particularly when its financial clout is coupled with awards recognition. This review is a bit superfluous in that regard, but I don’t think it’s without merit. It is entirely probably that the patriotic element is something that works well in America but not as well elsewhere. We all suffer as equals through blandness though, and this is bland filmmaking.